After 3 full days of rest, the Penguins played a rather flat game Thursday night in Carolina losing 4-3 in overtime. Brian Pothier scored the overtime winner for the Canes slapping one past goaltender Brent Johnson for the overtime win. The only positive out of this game for the Penguins, however, is that they will receive one very important point in the division standings leading into Friday night's showdown with the second place New Jersey Devils. The Penguins started out hot, getting goals from Jordan Staal and Bill Guerin in the first 6 minutes to take a quick 2-0 lead. The Canes then caught their stride and tied the game up going into the intermission with goals from Ray Whitney and Zach Boychuk, both goals being rather "soft" and possibly due to not being sharp on the Penguins' end. The Canes carried that momentum right into the second with a goal from Eric Staal, but recent "player of interest" Matt Cooke tied it right back up 4 minutes later by jamming away until he beat young goalie Justin Peters. It would be the last time Peters was beaten however, as he was lights out for the remainder of the game. Despite this disappointing performance, the Pens must regroup for the second game of the back to back series against the New Jersey Devils Friday night. This is considered as a "4 point game" as the two points to the winner will not only be important but the points not received by the loser will be significant as well. 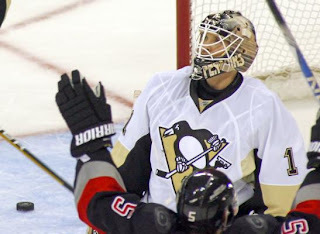 The Penguins have not yet beaten the Devils this year, so they best bring their "A Game."